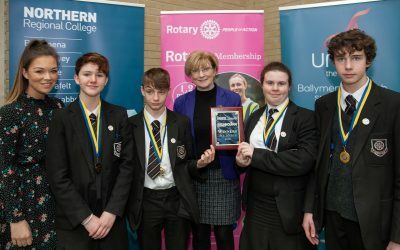 Teams are once again going head to head to win the Rotary Prize at this year’s Big Bang Fair. 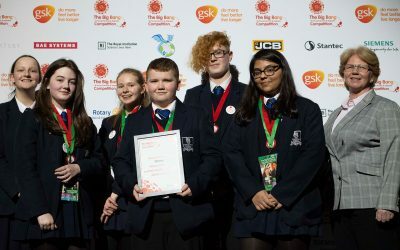 The Big Bang Fair is the largest STEM event for young people aged between 7-19 and includes theatre shows, hands on exhibits, interactive workshops, careers information and of course, The Big Bang Competition. Tickets are free, and over 80,000 attend the annual event over four days from 14th-17th March 2018. For many years Rotary has been involved with the fair showcasing our Technology Tournaments, which is held at the Birmingham NEC annually, but last year took a turn. This was because the introduction of the special award – which for 2018 will be Rotary Prize for Environmental/Scientific Advancement. The 2017 winners were Zack, Alex, Thomas and Cameron from Gillingham School, Dorset who created the Morbosphere. This was a vibrating sphere which sits in water and prevents mosquito eggs hatching and spreading killer malaria. With malaria being one of the deadliest diseases on the planet, perhaps this is what caught the judge’s eyes. The team were rewarded with an experience specific to their creation. For the boys, this was a trip to London Imperial College with special malaria researchers who tested their prototype. This year, the award returns and new winners will be found. They will be up against a judging panel of experts in their field, with the budding competitors fighting eagerly to be crowned the winners. Similarly, to last year, this year’s prize is an experience day – which is of course undecided until the winner is determined. It will be given by President Denis at the Awards event on Thursday 15th March. “After seeing the impressive competition last year, I’m sure the judges will have their work cut out!” Denis added. All the entries have had fantastic ideas; however, the finalists are all something remarkable. Some of their projects include: ‘The Effect of Diet on Methane Emissions from Dairy Cows’, ‘How does colour affect photosynthesis?’ and ‘Potato Power’. Will judges Jean Billingsley, Geoff Mackey and Lynne Bianchi have an easy decision?